It is square - promise! I left the quilting simple and bound it with binding left over from Siblings Together quilt 1. This quilt was fun to make, using raw-edge applique to sew on a variety of circles, some fussy cut, cut using lids and cups as templates. In retrospect I think it needed a couple more but I handed it over to its wee recipient and she was very happy with it, so that's good! There are lots of lovely circle quilts out there, like this at Purl Bee which uses a rather fiddly method to turn the edges of the circles or the tutorial here at Bijou Lovely for a completely different one, with circles arranged in a grid. I think a random circle bed quilt would be fun for a child - perhaps with some colourful hand quilting. Do you have a constant list in the back of your mind of things you want to try? I've added this to mine which is getting longer and longer! I'm also linking up to the Let's Get Acquainted blog hop again (see the button in my sidebar) and have hopped over to visit Heidi at Fabric Mutt and Amy from Amy's Crafty Shenanigans where you can see how high they have set the benchmark for the rest of us with great tutorials for a Quiet Book for children travelling, and a frayed edge quilt. I love Heidi's Watercolour Quilt and Amy's has entered a really clever mini in the Play competition. Love your circles quilt! I have one in my header that I made last year, similar to the Purl Bee mini. It is fun to see how different they look with different fabrics : ) Yours is lovely. I came from Fabric Tuesday. I love this! So beautiful - she must be a very special doll :) I hope your weather isn't coming our way! Ooo I love your circles!!! And yes, I too have a list of things I want to try (and make and do) at the back of my mind - there just isn't enough time in the day!! Thanks for your kind words about my frayed edge and my mini :) You made my day. 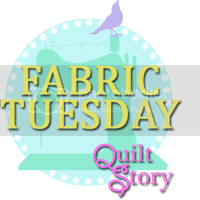 Followed your link over from Quilt Story/Fabric Tuesday! Sweet doll quilt! Yes I have a mental list of wanna-do's but I don't want to make a concrete list until my UFO's are all complete! Circles are at the top of my list though. What a neat way to really showcase different fabrics. I just became a new follower of your blog - look forward to reading more! Such a sweet quilt - love the binding. And yes I keep a very long list of things to try in my head - I really need to start writing it down. A constant list of things you want to try? Yes! LOL, I want to try sewing curves into a quilt, I want to try hexagons, I want to try applique.. yes the list goes on and on!